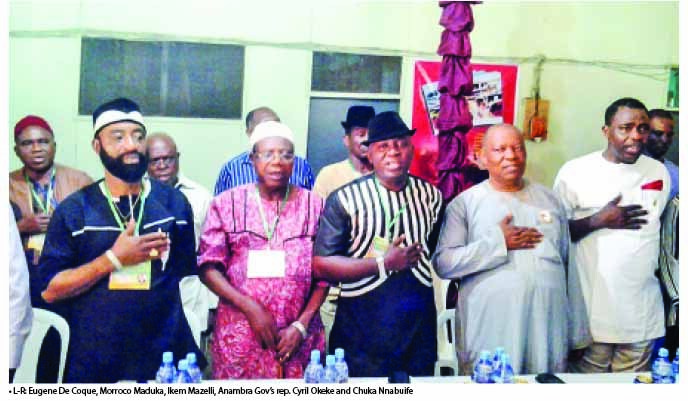 Over 1,000 musicians and artistes under the umbrella of Performing Musicians Association of Nigeria (PMAN), Anambra State branch, recently converged on Awka to brainstorm and chart the way forward for their members. The half year seminar/workshop tagged: “Musical entertainment in defeat of unemployment and political thuggery” saw the musicians collaborating with the Anambra Newspapers and Printing Corporation, publishers of National Light Newspaper. At the occasion, the artistes told themselves some home truths on why they have not reaped bountifully from their toils, saying that it was time for them to fly higher. Anambra State Governor, Chief Willie Obiano, who was represented by his Senior Special Assistant on Political Matters, Hon. Cyril Okeke, led other government functionaries from the Ministry of Information and Culture to the workshop with a firm promise to partner with the musicians in their further activities in the state. PMAN governor in Anambra State, Hon. Ikem Mazelli, in a welcome remark described musicians as employers of labour who occupy a critical sector of the society. He thanked Governor Obiano for providing a conducive atmosphere for entertainment to thrive in the state through effective security, noting that the governor has made Anambra safe again. Mazelli, a popular highlife artiste known in the musical circle as Material Onyenwegwu, noted that it was in fulfillment of his promise while taking over to unite and harmonise all sectors and sections of the music industry that he ensured that the Anambra PMAN operated under one umbrella irrespective of the genre of music one plays. Speaking, the Managing Director of the Anambra Newspapers Company, Sir Chuka Nnabuife, took the artistes on a jolly ride of knowledge that many wanted him to continue when he drew the curtain. Chuka noted that if music was a good thing then the musician has a social responsibility to the society. He described the musician as an entrepreneur, employer, entertainer and consumer who should be versatile by knowing the art of singing, dancing and communicating with the audience. He challenged the musicians to know the culture and peculiarities of their environment and also try to locate the market and target audience for their songs. He described Anambra as a fertile ground for musicians to thrive and excel because of the youth populace and existence of many tertiary institutions in the state. He advised Anambra based musicians against the mad rush to Lagos, noting that the reasons musicians flee to Lagos has to do with what he called the F-factors namely , Fear, Fantasy, Facilities and following the crowd. He acknowledged that the music crowd is huge in Lagos, but the consumership is slim and advised the artistes to look inwards to rediscover and invest also in themselves. A veteran singer, guitarist and music producer who incidentally is the only person from the South-East in the board of Copyright Society of Nigeria (COSON), John Ewelukwa Udegbunam, in his presentation took the artistes on their intellectual property rights. Udegbunam expressed regret that most of the artistes are ignorant of the copyright laws of Nigeria thereby making them unable to register and protect their intellectual property like music. He informed the audience that it was a criminal offence for deejays, radio and television stations, hotels and other public places to broadcast or play artiste songs without permission or payment of royalties. He said that the Tony Okoroji-led COSON has sued 42 Federal Government-owned radio stations in Nigeria for payment of artiste royalties and has also recovered monies running into billions of naira for artistes, including the telecommunication companies who use artiste songs as phone caller tunes. Udegbunam also urged all artistes with recorded songs to register with COSON and also disclosed that the war against pirates replicating people’s songs and the popular MP3, MP4 downloading of songs was ongoing. Secretary of the Caretaker Committee of Musical Product Dealers Association of Nigeria (MPDAN), Sunny Chris Agubosim in a presentation also disclosed that the association has mapped out plans to enhance the sales of published musical works, disclosing that to achieve the drafted plans, strategies are being perfected to eradicate the abuse of musical works through the illegal transfer of such works via virtual devices. He said the association has commenced public enlightenment campaigns and also formed the Joint Anti-Piracy Squad which shall be actualized through the combined efforts of the Nigerian Copyright Commission (NCC), with other military and para-military security agencies in the state. South East Premier of the Musicians body, Chief Morroco Maduka in a remark lamented the lack of love among the artistes. He bemoaned the level of backbiting and character assassination among artistes today and called on upcoming artistes to package themselves with respect instead of acting beggarly all the time. He lambasted the COSON members picking holes in most of what Udegbunam said earlier about the protection of intellectual property. Morroco accused the COSON of not being sincere in their sharing of royalties to artistes, noting that despite the fact that he has recorded 78 albums to his credit, COSON only paid him N12,000 as royalty after all his entreaties. He also challenged the music marketers to review their strategy, noting that the marketers are also killing the industry. He frowned at the low cost of compact discs in Onitsha which goes for as low as N70 while in other places, they sell between N200 and N250. He solicited prayers for those of them who have stayed long in the industry like King Sunny Ade, Bongos Ikwue, Victor Uwaifo, Emma Ogosi and Ebenezer Obey.